You may have a lot of paperwork to file after your divorce is final, including documents to transfer ownership in items you bought while married. You will have to use different methods to transfer ownership or responsibility for debts, vehicle titles and real estate. One common method to transfer ownership of real estate is a quitclaim deed, which must be filed with the county. A quitclaim deed is a document that transfers property between parties without any warrantees. If you transfer property to your ex-spouse by a quitclaim deed, you are transferring whatever interest you own without any guarantee that there are no "clouds" on the title that could interfere with the transfer. Clouds on a title include encumbrances, liens or improper conveyances. Your ex-spouse can’t sue you later if it turns out there were problems with the title to the property. This type of deed is common in divorces because, theoretically, both spouses are already familiar with the property and would know if there were problems with the title. If you owned a home together, filing a quitclaim deed will change ownership from both of you to just your ex-spouse. The party transferring the real estate usually prepares the quitclaim deed since the divorce decree often makes it his responsibility to transfer the property. For example, if your divorce decree states that you must give your share of your home to your ex-spouse, you must prepare the deed and ensure it is properly recorded. 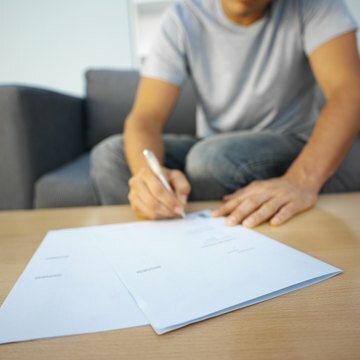 A Florida quitclaim deed typically must include at least a description of the property, your name as grantor and address, your ex-spouse’s name as grantee and address, your signature with your name printed underneath, signatures of two witnesses with their names printed underneath and an acknowledgement by a notary. Your county probably also has formatting requirements, such as a required statement about who prepared the deed as well as margin sizes. An online legal documents provider can help you create an appropriate quitclaim deed. The deed must be recorded at the county office where official land records are recorded in the county where the property is located. Often, this is the county’s comptroller or clerk office, and you can usually mail the document if you can’t visit the office to record it in person. When you record the deed, you will not be required to pay Florida’s Documentary Stamp Tax if you are transferring your marital home due to a divorce, but if you transfer other real estate, you will be required to pay the tax. There may also be a small recording fee for filing the document. Orange County Comptroller: What Are the Requirements for Recording a Deed? When a couple separates, they must separate their personal lives, their finances and their property. During marriage, spouses often borrow money in both names to purchase automobiles that they title jointly. Unless you want your soon-to-be-ex-spouse driving around indefinitely in a car with your name on it, make sure to get the title changed over as part of the divorce process.